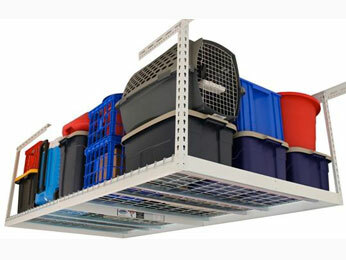 Professional organizers often recommend “looking up” to find storage space, and our overhead garage storage solutions help you make the most of every inch of your home’s available storage space. More than half of homeowners with two car garages can’t fit two cars inside due to other storage needs – and 25% can’t even fit one car inside! Ceiling garage racks enable you to store items out of the way, but still within easy reach, reducing frustration and helping you run a more functional, more organized home. They increase your usable space, and for many clients, this means being able to fully utilize their garage space to protect their vehicles. Overhead Door Company of Northern Kentucky can help you create a fully-utilized garage storage space that opens up a whole new world of possibilities for home storage. Contact us for a free sales estimate, and let us help you create a more organized home.